Our Fudge Brownie Mix is made from the highest quality ingredients, including specialty cocoa powder for a chocolaty taste like no other. And no hydrogenated oils or artificial colors or flavors means it’s a guilt-free dessert experience! POWDERED SUGAR (SUGAR, CORNSTARCH), ENRICHED WHEAT FLOUR (NIACIN, REDUCED IRON, THIAMINE MONONITRATE, RIBOFLAVIN, FOLIC ACID, ENZYMES), CANE SUGAR, COCOA (PROCESSED WITH ALKALI), SHORTENING POWDER (SOYBEAN OIL, MALTODEXTRIN, SODIUM CASEINATE, MONO & DIGLICERIDES, AND DISODIUM PHOSPHATE), EGG WHITES, WHOLE EGG (YOLK, DRIED EGG WHITES, DESUGARED FOR STABILITY), SALT, NATURAL VANILLA FLAVOR, BAKING POWDER (SODIUM ACID PYROPHOSPHATE, ENCAPSULATED SODIUM BICARBONATE [PROPRIETARY BLEND OF OILS], SODIUM BICARBONATE, CORN STARCH, DICALCIUM PHOSPHATE, MONOCALCIUM PHOSPHATE). Add 1/2 cup hot water to 3 3/4 cups mix [1 pantry can] and stir well for about 1 minute. Let sit 10 minutes and pour in a greased 8x8 pan. Bake at 360°F for 22-25 minutes. 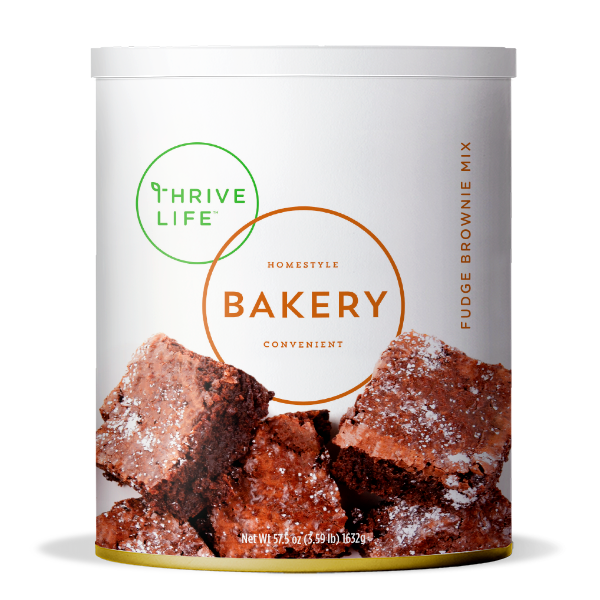 Our mix makes easy, perfect brownies every time! Try adding nuts, white chocolate chips, and crumbled THRIVE Raspberries for deluxe chocolate raspberry brownies. Use it with our Classic Cookie Dough to make yummy half-and-half cookie bars!